It's plain sailing so far on Wednesday. 1. 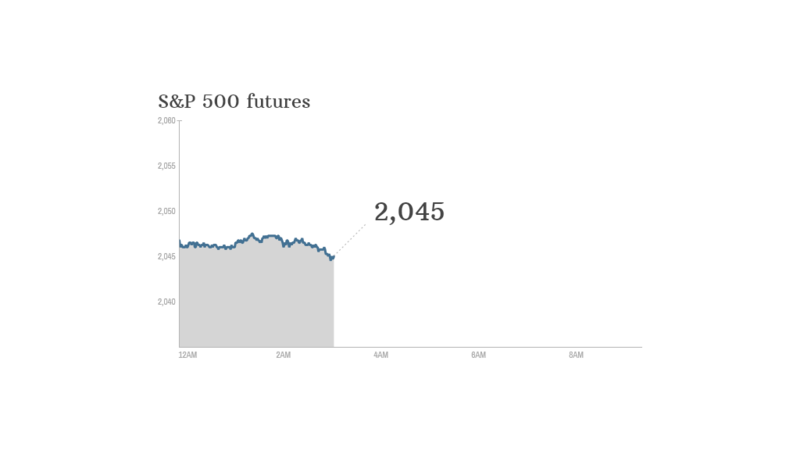 Earnings and economics: U.S. stock futures were little changed as investors looked ahead to a batch of fresh economic data and company earnings. The Fed will publish minutes from its October meeting at 2 p.m. ET. The U.S. government will post monthly housing starts and building permits at 8:30 a.m. ET. Lowe's (LOW), Staples (SPLS) and Target (TGT) will report quarterly earnings before the opening bell. Keurig Green Mountain (GMCR)and Williams-Sonoma (WSM) will report after the close. U.S. stocks closed higher Tuesday. The Dow gained 40 points, the S&P 500 rose 0.5% and the Nasdaq was up 0.7%. 2. Stock market movers: Shares in auto supplier Takata fell more than 7% in Tokyo following pressure from the U.S. government to widen the recall of exploding airbags made by the Japanese firm. Urban Outfitters (URBN) was down 4.4% premarket after the company issued disappointed earnings earlier in the week. In Europe, shares in French nuclear group Areva (ARVCF) slumped 17% after it suspended its financial outlook for the next two years due to problems at a Finnish project and delays bringing Japan's reactors back on stream. 3. International markets overview: European markets were little changed in early trading. Asian markets ended mostly lower, led by a 0.7% decline in Hong Kong. 4. China disconnect: The Shanghai-Hong Kong Stock Connect -- which allows international investors to buy stocks in Shanghai -- continued to falter in its third day of operation. Buyers were nowhere to be found, and only slightly more than one-fifth of the daily Shanghai quota was filled. 5. Japan: Fresh from its shock Halloween stimulus gambit, the Bank of Japan said it will maintain current policy for now. Support for the central bank's massive stimulus plan firmed, however, as three of last month's holdouts voted with the majority. Analysts say it's likely to have to do more to hit Japan's inflation target but may be deterred if the government's commitment to budget discipline weakens. The Buzz: Will Apple soon be worth $1 trillion?